Many vineyards, large and small, lie along the Tamar River close to Launceston. Several wineries have their own quality restaurants, adding to the Tamar Valley’s appeal for lovers of fine food and wine. Many grape varieties do well in the Tamar Valley region because the river provides protection against frost. Pinot Noir, Chardonnay, Riesling and Sauvignon Blanc are notable, while varieties such as Merlot and Cabernet Sauvignon ripen with consistency. The Tamar Valley produces about 40% of Tasmania’s wine. Rosevears Estate Winery, Tamar Valley, Tasmania. Wines under the Three Wishes Vineyard label have made their mark in the Tasmanian Wine Show three years running. Read more on the three wishes website. At 136 hectares, Tamar Ridge Kayena Vineyard is Tasmania’s largest vineyard. Andrew Pirie is the CEO and chief winemaker. The well-priced, award-winning wines can be tasted in the winery or beside the lake. With four trophies, four gold medals and eight silvers, Tamar Ridge was the most successful exhibitor at the 2007 Tasmanian Wine Show and was also awarded the Richard Langdon Trophy as the 2007 Tasmanian Vineyard of the Year by the Royal Agricultural Society of Tasmania. Devils Corner is their earlier-drinking label. A mature seven-hectare vineyard with a big reputation. Holm Oak Vineyard takes its name from the evergreen trees planted across the property. The vineyard was established in 1983 with the intention of producing premium cool-climate red wines. Initial plantings were of Pinot Noir and Cabernet Sauvignon. Merlot and Cabernet Franc followed and then came Riesling. The oaks and other European trees provide shelter and warmth, ideal conditions for a riper, bigger style of red wine. The first was produced in 1988 and in 1993 a Riesling was produced for the first time. East Arm Vineyard is a small producer best known for their Riesling. Established in 1993, this two-hectare vineyard is located on the banks of the Tamar River at Hillwood, close to Batman Bridge. They also produce Chardonnay and Pinot Noir. The name symbolises the three generations of the Whish-Wilson family that have produced award-winning premium wines. The wines are hand-crafted to reflect the natural beauty and historic character of the site, where small parcels of Pinot Noir, Chardonnay and Riesling grapes are grown on three hectares of steep, ultra low-yielding soils overlooking the Tamar River. It is known in the wine industry that the “warmest sites in cool climates” can grow exceptional wine grapes and the Three Wishes vineyard is proving to have a unique site climate for Tasmania. It is located on the Batman Peninsula, surrounded by water and protected from prevailing winds by a natural amphitheatre. Soils vary across the site but are mainly rough gravelly loams, well worn by years as apple orchards. The steep north-east facing slopes provide airflow and warm ripening conditions. Now into their fourth vintage these award-winning wines have attracted considerable attention. The low volumes of production mean that they are sought after. They have started a five-year program to grow wine according to organic principles with minimal pesticide and herbicide practices. Iron Pot Bay Vineyard (five hectares) was established in 1988 by Roderick Cuthbert and Kyra Hinman. The name Iron Pot Bay comes from the original name of a nearby bay which is now called West Bay. A low altitude area ideally suited to wine production it has a cool climate with long, mild growing seasons. The river has a moderating effect on the climate. Several varieties of white grapes were planted originally, mainly Chardonnay but also Sauvignon Blanc and Semillon. Pinot Gris, Traminer and Riesling have since been included. The winery’s red wine grapes come from an associated West Tamar vineyard. Iron Pot Bay Wines pioneered unwooded white wines in Tasmania. The absence of oak treatment was extended in 2003 to include an unwooded Pinot Noir. The vineyard’s tasting room, deck and terrace are in a garden setting overlooking the river. This vineyard was established in 1997. The first grape harvest was in December 1999, with Pinot and Chardonnay bottled in 2000. 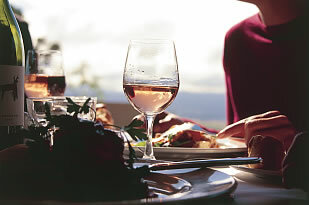 In 2002 Cabernet Sauvignon, Merlot and Riesling wines were added. The Chardonnay is a barrel-fermented style with the wine remaining in barrels for six to eight months on lees which are stirred regularly to impart a toasty complexity and elegance. The Pinot Noir is produced from low-cropping vines. It is hand-plunged during primary fermentation and then matured in French barrels. Joe and Lou Holyman bought the old Rotherhythe cellar door in 2004 and have since revitalized the 20-year-old boutique vineyard with their passion for growing grapes and with a European winemaking philosophy. The Stoney Rise Vineyard is planted to Pinot Noir and Chardonnay on four hectares and has panoramic views of the Tamar River, with Mt Arthur and Mt Barrow as a backdrop. The Holyman family has been involved in vineyards in Tasmania for 20 years and Holyman is the name of their reserve label, used only for the best wines from estate-grown fruit. The first wines were a Pinot Noir and Chardonnay from the 2003 vintage. Most of the Chardonnay is fermented in new French oak barriques before being bottled early to retain its freshness. Home to the Pirie Estate and South range of wines, Rosevears Estate is a vineyard/winery/restaurant/accommodation complex located 15 minutes north of Launceston. It was established in 1999 when three local vignerons – Michael Beamish, Roger Martin and Rod Cuthbert – had a need for a working winery able to crush their Tamar Valley grapes in the same region where they were grown. Since the first vintage, Michael Beamish has worked closely with winemakers Jim Chatto and Russell Cook to create wines that are distinctive and expressive of the Tamar Valley. In 2004 Dr Andrew Pirie, regarded as a leading figure in the Tasmanian wine industry, joined the Rosevears team as winemaker. Since then he has been making the Rosevears and Notley Gorge Wines and, at the same time, leasing the winery to produce his own brands of Pirie Estate and South. John Vincent’s acclaimed Rotherhythe vineyard is situated in Rosevears with a waterfront setting. Rotherhythe is known for mature wines. These are available for tasting at the cellar door. Besides being a premium product the wine has three further advantages: it is competitively priced, it has time in the bottle and it is stored in an insulated cellar room at exactly 18 degrees centigrade. The Ninth Island brand is one of Tasmania’s most visible, both nationally and internationally. Don Buchannan developed the vineyard in the Tamar Valley in the late 1980s and Pipers Brook acquired it in 1993. The site is approximately 36 hectares in size of which about 50% is under a lyre trellis system. Being on the banks of the Tamar River, inland and therefore less exposed to the prevailing north-west winds, the site avoids the frost risk of some of the other Pipers Brook vineyards. Tamar River vineyards experience slightly warmer average temperatures than the more coastal Pipers Brook and Pipers River regions. As a consequence grapes generally mature some ten days earlier and there are slightly higher yields. This increases ripening potential and creates a useful spread of harvesting and processing times. It is ideally suited to the production of later-ripening varieties such as Riesling and Sauvignon Blanc. The Strathlynn Restaurant at Ninth Island Vineyard offers a fine dining experience. Planted by industry pioneer Graham Wiltshire in 1996, this is the oldest vineyard in the Tamar Valley and home to Tasmania’s oldest Cabernet Sauvignon vines. Now expanded to three hectares, new owners Micheal and Mary Wilson re-named the vineyard “Velo”, which means “bicycle” in French. Micheal Wilson is Tasmania’s only Tour de France cyclist. He is also a viticulturist, winemaker and an association wine judge. Velo produces outstanding wines. While retaining traditional methods of harvesting and winemaking the Wilsons have also imparted a contemporary image to the brand.